The aim of the game is to pick up treasure chests that spawn randomly in the middle of the map and return them to your castle. You can carry up to 4 different chests, so sometimes it might more advantageous to pick up more chests instead of going back and forth. However, some chests contain bombs, which make you lose all the treasure you’re currently carrying. 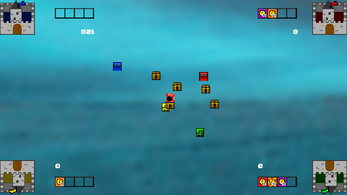 Furthermore, players can push each other around, either to push them away from treasure chests, or to push them ONTO treasure chests, potentially making them pick up a bomb.